I'd like to say that everything is going swimmingly, but that's simply not true, though I have hopes that an epiphany is imminent. Saw friends this weekend who are sure that my moving away from Florida is a mistake, or at the least should be undertaken on a temporary basis of 3 months a year, and not on a permanent basis. They are afraid that I am making a mistake, will move to a place where I know no one and be lonely, and have advised renting before buying. Here's a picture of a 4/2 house in a little place called Lakeside, Montana. 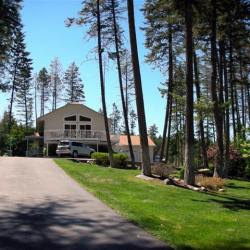 It has beautiful views over Flathead Lake and can be purchased for the very reasonable sum of $249,000. I have never been to Lakeside, it looks like a lovely area, though according to the data I've seen on City Data's very useful webite, it's not the sunniest place during the winter....which doesn't bode well for my Seasonal Affective Disorder which I don't have yet but I'm sure to develop as soon as I'm placed in the midst of a long grey winter. 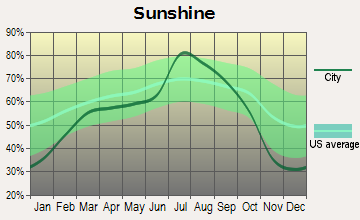 According to the graph, I can expect two of three or at most every other day to be overcast. On the other hand, at least I can afford the homes in this area and the scenery is beautiful....would that be enough compensation? Speaking of compensation, is it even possible to find employment in such lovely settings? My wanderings around City Data's forums reveals a lot of griping about the low wages in Montana. I wonder if this is true or simply written by locals who would like to keep further migration to their beautiful state to a minimum. I thought Montana was "blue sky" country....but that's "big sky" country, isn't it? ;) Regarding low wages, well that might be a distinct possibility.